Why am I smiling? I'm done. 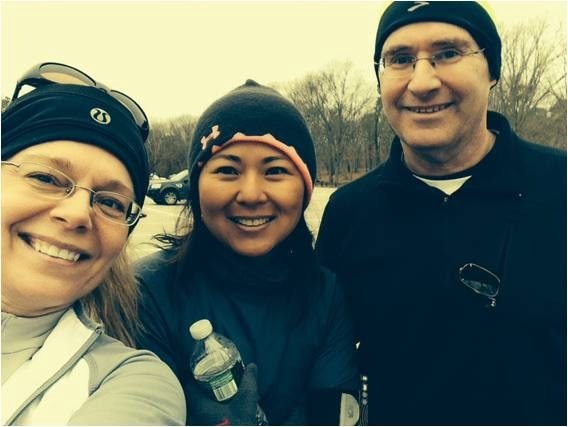 Today's run with my Runsketeer buddies had its ups and downs, and I'm not referring to the hills at Bethpage. The ups came from spending time with two of my favorite people, SIOR and TPP, who joined me on the trail this morning. The downs related to the struggles I had trying to cover 6 six miles today. It was the second Sunday in a row where I went out for a long run with great hopes, but ended up with a disappointing performance. SIOR was running 17 miles today. She covered all but six of them before rendezvousing with me and TPP on the north trail at Bethpage. TPP and I took off in SIOR's direction and we both noted that the pace felt challenging. This was not a good sign for me because we were running slower than our normal training paces and I feared that today would be a repeat of last Sunday's performance. It turns out that it was. We met SIOR at the one mile marker on the north trail. She had done an out and back from the parking lot and we all decided to head north from there. Both of my group-mates are speedy, although TPP has been hurting a bit and is still dealing with respiratory issues. She took a few moments for recovery (as did I) throughout the run, but when she was in "running mode" she did an impressive job of keeping up with our speediest run-mate. Much of today's run was spent watching my buddies progress from a distance. At first my gap was about 30 feet as they tried to keep me included. They both slowed or stopped so I could catch up and participate in the conversation. Unfortunately, I struggled to both talk and run and eventually encouraged them to open up and run their faster pace. They are great people and they followed a "No Runsketeer left behind" policy, so periodically I would spot them waiting for me to catch up. I am still puzzled by my difficulties today. They started early and remained, just like last week. I had really good runs on Wednesday, Thursday and Saturday where I maintained my targeted training paces. Wednesday's run was 4.4 miles where I ran strong from start to finish. Yesterday I did a hard three miles near targeted half marathon race pace. The only variable that could explain it is the weather. Last Sunday's run and today's were both around 30° with wind-chill and I wonder if I've developed a cold induced breathing issue. I managed to cover six miles per my training schedule, although there were a few stops for rest and to let traffic pass on Old Country, Old Bethpage and Haypath roads. It was a strange experience to be running with such a high perceived effort, yet not being able to keep up with the continually shrinking silhouettes of my friends as they disappeared over the many hills along our route. SIOR made it to our end point first, followed by TPP who threw in surges at the end. I rolled in a couple of minutes behind her. 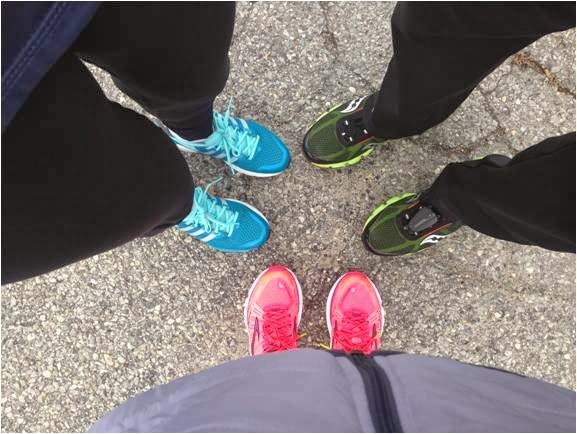 One of the "ups" from today was when the three of us took a few minutes to chat at the three mile point of our run. We didn't get a chance to go for our traditional Starbucks after-run coffee, so this was a nice substitute. We also took a few minutes once we finished, but the combination of cold, sweat and scheduled obligations caused us to cut that short. I'm trying to look on the bright side. I got to spend time with my buddies and ran my planned distance. After last Sunday's tough run, I did far better throughout the week. Hopefully that will repeat this week. Eventually I'll get past whatever it is that's making my Sunday runs so difficult. It may be something as simple as warmer weather. It's spring, so theoretically that should come soon. I actually wound up only running 15 total. I was doing my best to keep up with TPP most of the run. It made what otherwise would have been a boring, monotonous run, fun and enjoyable. Thanks! It was a pleasure. I hope to end my performance-related anti-socialism at some point. sometimes it is the joy of just running with friends that can outweigh a tough run. Love it.